Joe Harrington was the golden boy of Maine basketball. His play at Morse High School is without parallel. He led Morse High School to the State Championship in 1963 and lost to Stearns in the New England Championship by a single point. He was a two- year All- State player. After high school Joe attended the University of Maryland on scholarship where he was a four year starter. The Boston Celtics drafted Joe in 1967. Joe started an illustrious coaching career at the Univ. of Maryland under legendary coach Lefty Driesell. 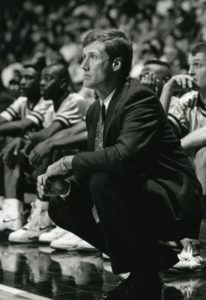 He was the head coach at Hofstra University, George Mason University, Long Beach State, and the University of Colorado.